There is absolutely no doubt that mechanical keyboards are the preferred choice of gamers, typists and professionals. Because of the mechanical switches they are durable, fast, reliable, sturdy, put less stress on your fingers and feels great to type on. Once you switch to a mechanical keyboard then you won’t get back to a membrane or rubber dome keyboard again. However, on the flip side, mechanical keyboards tend to make much more noise compared to rubber dome or membrane keyboards, and due to this they always face criticism of being loud, especially in quieter environments or work places like offices, hospitals etc. The Cherry MX blue switches are the loudest while browns and reds are comparatively quieter, but they also generate a decent amount of noise too. To make these traditional mechanical switches quieter, you can use O-rings that suppresses the noise to some extent, but they may not work every time as expected with some keyboards in dampening noise, and also some people don’t like the feel of it because it kinda feels mushy. 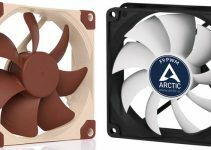 So, what to do when you want to use mechanical at quieter place? Well the solution to this problem is to use quiet mechanical keyboards that come with quiet mechanical switches. Quiet mechanical switches generate very little noise and are suitable for silent work environment. Example of such quiet switches are Cherry MX Silent Red / RGB and Cherry MX Silent Black. These Cherry MX silent switches are developed by Cherry in collaboration with Corsair. These switches have less key travel distance (both pre-travel & total travel), and use patented noise reduction technology that involves placement of shock / impact absorbers at bottom and top area of the switch slider / stem. 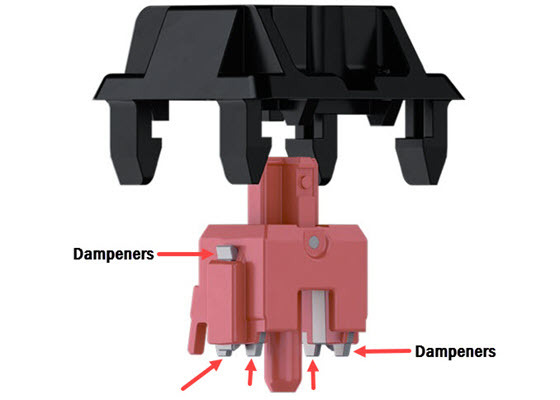 These shock absorbers or sound dampeners are made of rubberized plastic kind of material, and they minimize or dampens the contact noise to a great extent, when you bottom-out the switches. Cherry claims that these silent mechanical switches are 30% quieter than their regular counterparts. Below, you can see the comparison of Cherry MX Silent and Regular Cherry MX switches in terms of specifications and major characteristics. As you can clearly see that because of low key travel and sound dampeners, these switches generate relatively less noise compared to their regular counterparts. So, if you are looking for a quiet mechanical keyboard with these silent switches, then here, I am going to list some of the best ones, that you can buy for gaming or work. Note: Because of the use of mechanical parts such as springs, metal contacts etc., these quiet switches may generate a little noise in form of dull clack or thud sound, which is quite understandable and normal in mechanical keyboards. They may not be as quiet as some of the rubber dome or membrane-based keyboards, but they are much quieter than other mechanical switches, even when compared to the regular or standard Cherry MX Red, Brown, Silver or Black switches, which are also on the quieter side of the spectrum. So, don’t expect these quiet mechanical keyboards to be extremely silent, but they are silent enough to be used in a quieter environment. Here are the best silent mechanical keyboards that are great for streamers, gamers, offices, work places, typists, professionals, content editors and places where silent environment is necessary e.g. shared room, hospitals, banks etc. These quiet mechanical keyboards come with special Cherry MX Silent switches for quieter operation. 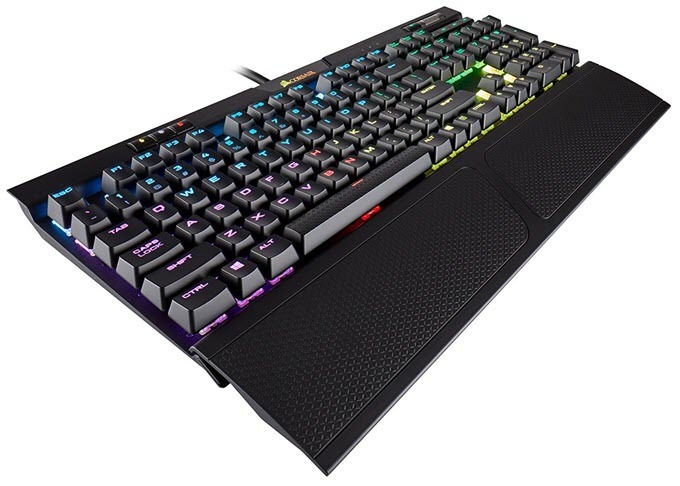 To begin with, here we have Corsair K70 RGB MK.2, which is a full-size mechanical gaming keyboard, but can also be used for work and typing too. The keyboard comes with Cherry MX Silent RGB switches, which are basically Cherry MX Silent Red switches with transparent housing, so that RGB lighting will look more pronounced and brighter. These are linear switches which means they do not offer any tactile feedback, nor they produce any audible click sound. They are great for gaming and for fast typists. The keyboard has good build quality and uses Brushed Anodized Aluminum frame. It is also a very good-looking keyboard and it comes with ABS keycaps with large fonts for better readability, and a textured spacebar that looks cool, and it also includes dedicated media and volume controls at the top. The keyboard has floating keys design which makes it easier to clean and maintain. For gaming, it comes with features such as 100% Anti-Ghosting with Full-Key Rollover, 8MB Profile Storage with Hardware Playback, Windows Lock key mode and FPS / MOBA keycap sets. The RGB lighting and Keys (for Macro) can be customized using the Corsair iCUE software, which you can download from the Corsair’s official website. A USB pass-through port is provided that can be used for connecting your gaming mouse, headset, pen drive or other low power USB devices. The keyboard also includes a soft-touch detachable wrist rest to provide you utmost comfort during gaming or typing. It comes with a pretty thick braided USB cable, which is unfortunately not detachable. The keyboard officially supports Windows 10, Windows 8, Windows 7 operating systems. It can work on Mac OS too, but the software does not support Mac, which means you will not be able to customized the keyboard settings and lighting. Overall, a feature rich and high-quality quiet mechanical keyboard for users who prefer silent operation and fancy looks. Cherry not only make mechanical switches, but also the keyboards. Here we have CHERRY MX Board SILENT Keyboard, which is a full size (104 keys) quiet mechanical keyboard that comes with Cherry MX Silent Black / MX Silent Red switches. It is simple, plain looking mechanical keyboard with basic design and functionality. The build quality is kind of average looking but it not bad enough to complain about. The keyboard is not portable and is a little bigger in size. It has got laser-etched keycaps with clean big fonts that is very soothing to the eye and easy to read. The Cherry MX Silent Black switches are great for typing as they are stiffer, and offer a little more resistance at 60cN of force, which makes typing more accurate compared to the Red switches that are very light and may result in unforced typing errors or typos. The keyboard does not offer any feature except for N-key rollover. Also, it does not come with multimedia keys and windows lock key either, but it does include LED indicators for Num Lock, Caps Lock and Scroll Lock. 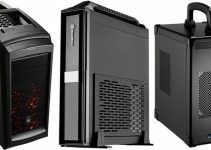 You can use it for gaming too, but it is more suited for work and offices where flashy stuff is not required and may get you in trouble. FNATIC STREAK is a super-thin mechanical keyboard that is designed for gaming. This slim and quiet mechanical keyboard is marketed as eSports keyboard, and it comes with Cherry MX Silent Red switches with RGB lighting. This is full size keyboard, but due to this slim design, it is quite portable and can in tight spaces too. It comes with a PU Leather wrist rest for providing comfort during long intensive gaming sessions, and during typing. The keyboard also comes with a FN enabled media keys and a volume control wheel. A USB pass through port is also provided for connecting your gaming mouse, headset, flash drive or other any other low power USB devices. The RGB lighting modes and other customizations can be done using its OP software. For gaming, the keyboard also supports 100% Anti-Ghosting with Full-Key Rollover and Windows Lock. A very unique feature of this keyboard is the removable signature plate that is LED lit, and the company claims that in future you may be able to customize it to your name. The keyboard has floating keys design and it also pretty light at 962g. The keyboard has solid build quality and the material used in its construction include Anodized Aluminum and Polycarbonate. Overall, an attractive looking, slim and beautiful quiet gaming mechanical keyboard that you can get your gaming needs, and for your typing as well. Note: A Tenkeyless variant is also available for this keyboard as FNATIC miniSTREAK that has the same specifications and feature list, except it lacks the metal volume control wheel. You can also check out this model from the link given below. Here we have another RGB quiet mechanical keyboard, which is IKBC MF108 RGB Mechanical Keyboard. This is a Full size (108 keys) keyboard, and comes with Cherry MX Silent Red switches. The keyboard uses double shot PBT keycaps that are much better in terms of durability and feel over ABS keycaps as they do not develop shine over the period. PBT keycaps also feels much better to type on, and they are always preferred by typists for work. The PBT keycaps in this keyboard are backlit by RGB LEDs. This a solid keyboard with aluminum frame construction and looks very elegant with its simple design. The keyboard features 3 Built-in preset layouts that are Qwerty, Dvorak and Colemak, and they can be switched by using FN key. This FN key is also used to activate multimedia and other shortcuts that are shared with the regular keys. For gaming, it does support NKRO with Anti-Ghosting and Macros that can be configured without using any software, but from the keys itself. Also, the RGB lighting modes can be changed from the keyboard without any software. The keyboard comes with a detachable USB cable, which really proves very handy when moving the keyboard from place to another. This is really a high-quality mechanical keyboard that can be used for both gaming and typing, where silent environment is a main concern. Note: A Tenkeyless (TKL) variant of this keyboard is also available, which is iKBC MF87 V.2 RGB Mechanical Keyboard. You can check it out too from the link given given below. Vortexgear Cypher is a 65% mechanical keyboard that comes with Cherry MX Red switches. The keyboard comes with 68 keys in total, and highly durable PBT keycaps (laser engraved). The keyboard features two layers for working, where the default layer is what you normally see, and the function layer consist of extra functions that can be accessed by pressing the FN key. In addition to that, you also have access to Three programmable layers, each layer has its own LED under the left spacebar to indicate what layer is enabled. The keyboard also allows you to program to up to one hundred characters per key. To enter the programming mode, select your layer, and then press FN + CTRL key. There is a special Pn key present on the side of Fn key to set or finalize the programming key. The keyboard also offers three customizable layouts that include Qwerty, Dvorak and Colemak. It comes with a detachable USB Type-C cable for convenience. This is a great keyboard for programmers, coders and typists. So, if you are looking for an ultra-portable quiet mechanical keyboard for work that can easily fit in your laptop bag, then this is the one for you. Note: Make sure that you have latest firmware installed for this keyboard. You can download the firmware and the instruction guide for this keyboard from vortexgear support page. Important Note: All the above mentioned mechanical keyboards have polling rate of 1000Hz (1ms). Here are some other good quiet mechanical keyboards that you may want to check out. How to Silence Mechanical Keyboards? 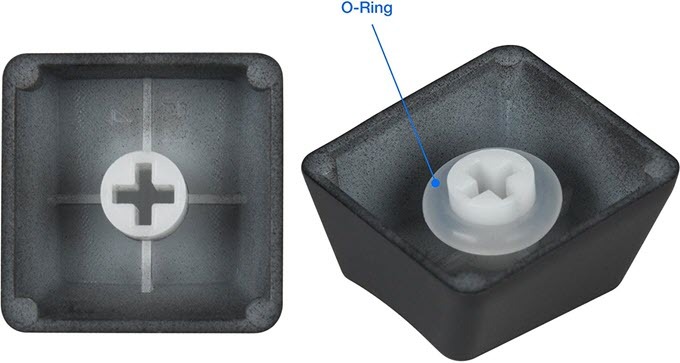 If you want to make your current mechanical keyboard (without silent switches) to make less noise, then you can install rubber O-Rings in at the bottom of keycaps, that can dampen the noise to some extent. Here are some good quality O-Rings that you can get for this purpose. High quality Silicon O-Ring Dampeners for Cherry MX mechanical switches. Due to their translucent material, they allow light to pass through them and therefore it will not reduce the intensity of the back-lighting that your keyboard have. They dampen the keystroke noise when you bottom-out the switch, and they also reduce the key total travel distance. They absorb the impact by creating a softer landing, reducing finger fatigue. 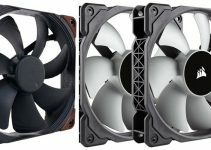 These Rosewill O-Rings are also resistant to cracking, tearing and lasts longer. Highly Recommended by me. The Package also includes a keycap puller, microfiber cloth, dusting brush. Some other silent mechanical switches besides Cherry MX Silents are Gateron Silent (Red/Brown/Black), Zeal Silents (Zilents), Aliaz switches. I would say that quiet mechanical keyboards do work great in minimizing noise and they are comparatively quieter than standard mechanical keyboards without silent mechancial switches. These quiet mechanical keyboards are great for offices, work and for gamers and online streamers. They are kind of new to this tech world, and currently there are not many options to choose from. However, I have done my best to list the best quiet mechanical keyboards that in market right now, and if you have any queries regarding them then feel free to ask here by leaving a comment below.